The SMASH is excited to offer another tournament to the many High School and Junior Club players. The Mission of the Susquehanna SMASH is to introduce Juniors players to the game of doubles volleyball. 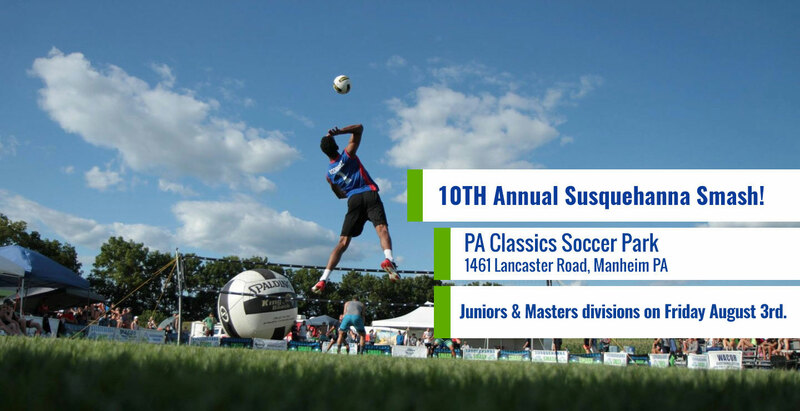 The Susquehanna SMASH will be playing “old school” rules similar to the Pottstown Rumble. If you are under age 18, you will need to include a signed waiver mailed in the same envelope as your entry. Waivers are available for download below and MUST be signed by a parent or legal guardian. You WILL NOT be allowed to play without a signed waiver. *Attention Juniors Players You will need to download a tournament waiver to be signed by a parent or legal guardian. You MUST have a signed waiver for all players under the age of 18. *Division could be combined with Junior Girls 16 & Under. Entry fee for the Juniors’ divisions is $60 per team. The Smash is now offering a division for women who are 40 years old or older to compete against women of their own age. So make sure to bring your sports cream and pain pills to survive the doubles competition. Prizes for women’s Senior 40s & Over will be awarded to the top 4 teams in each division. The Smash is now offering a division for guys who are 40 years old or older to compete against men of their own age. So make sure to bring your sports cream and pain pills to survive the doubles competition. Prizes for Men’s Senior 40s & Over will be awarded to the top 4 teams in each division. The Smash is now offering a division for guys who are 45 years old or older to compete against men of their own age. So make sure to bring your sports cream and pain pills to survive the doubles competition. Prizes for Men’s Senior 45s & Over will be awarded to the top 4 teams in each division. The Smash is now offering a division for guys who are 50 years old or older to compete against men of their own age. So make sure to bring your sports cream and pain pills to survive the doubles competition. Prizes for Men’s Senior 50s & Over will be awarded to the top 4 teams in each division. Or any other inquiries please feel free to email us.